The Little Stranger is Lenny Abrahamson's (Room, Frank) latest film, and it's a confounding piece of cinema that manages to cram in a lot while doing relatively little. It's a gothic a ghost story without many spooks that rings as hollowly as skeleton bones. Based off Sarah Water's 2009 novel of the same name, The Little Stranger is a "ghost story" set in a dilapidated mansion, known as Hundreds Hall, in Warwickshire, England in the 1940s. It tells the story of Dr. Faraday (played by the cold and calculated Domhnall Gleeson), the son of a housemaid, who has built a life of quiet respectability as a country doctor. During the long hot summer of 1948, he is called to a patient at Hundreds Hall, a once elegant estate that now sits in relative ruin. The estate has served as home to the Ayres family for more than two centuries, and its inhabitants — mother (Charlotte Rampling), son (Will Poulter) and daughter (Ruth Wilson) — are haunted by something more ominous than a dying way of life, which is closer to Dr. Faraday than he actually realizes. 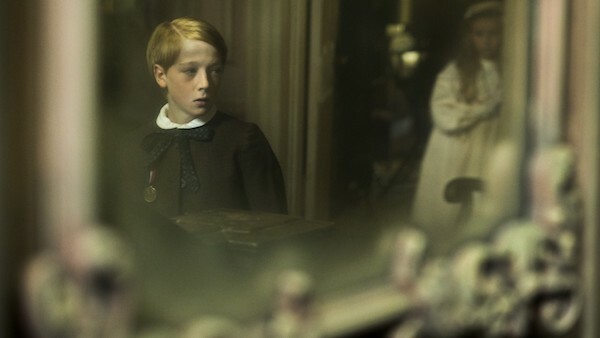 The Little Stranger somewhat manages to defy any real categorization. It's little bit of everything — a haunting, a drama, a comedy, a period thriller, a mystery and a romance — which could be a good thing if it culminated toward a cohesive experience. However, the film comes off like a jumble of ideas that don't quite stack up, falling like a sheet that a clichéd apparition would hide under. The ending, in particular, is a head scratcher, which may get some thinking, but made the experience ultimately forgettable (for me). Water's novel focuses heavily on the social upheaval of the class system in postwar Britain, which doesn't really translate in the film adaptation. The novel also handles the supernatural elements with more ease and subtlety, never really showing its hand; whereas, the film's final revelation shows all, which raises more questions and confusion that don't really satisfy. Had the landing been stuck, the experience may not be quite so tarnished, but as it stands, it leaves you feeling as if you'd watched 2 hours of nonsense gibberish. The set design sticks out as positive element, and it's easy to get sucked into the decrepit allure of Hundreds Hall. The performances are also fairly sturdy, particularly Poulter who continues to show new shades of versatility. However, nothing really manages to fully satisfy or meet expectation. For all its subversion, which is tolerable for the first hour, it drones on unnecessarily long and undercuts itself with a soft and beguiling conclusion. It's one of those films that makes you wonder why it was ever made, as it doesn't seem to be filling any certain need. It's a massive step backward for Abrahamson, who won critics over with his claustrophobic thriller Room. Feel free to sit this one out, unless you have a burning desire to endure a dry-bone slog. Rating: 2 flaming bookshelves outta 5. What do you think? Did you enjoy The Little Stranger? We want to know. Share your thoughts and feelings in the comments section below, and as always, remember to viddy well!